Sunday School provides opportunities for families to learn together and also provide age appropriate activities. Sunday School is geared toward families with children zero through fourth-grade. Families will gather together in the St. Paul’s Chapel twice a month for music, prayer, and Bible stories. Family activities will follow to reinforce the Bible story for that week. The other two Sundays will be for children in preschool through fourth-grade and will be filled with faith-based activities. For families with children zero through preschool age, there will be materials available to take home these Sundays. We firmly believe that parents are the primary faith formers in their child’s life. We want to equip and enable families to develop their child’s faith. The 2018-2019 school year is upon us. 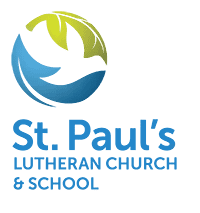 St. Paul’s continues to offer expanded programming for families on early dismissal Wednesdays. Saints Alive is open to the entire community. During Saints Alive, children experience worship, games, hands-on learning grounded in Scripture, snacks and more. There is a small fee for Saints Alive — $100/ child or $150/ family for the entire year. The curriculum for Saints Alive comes from a company called Orange. This curriculum focuses on helping children to develop a deeper faith, build stronger relationships, and make wise choices. The year is divided into units that focus on one main topic. It is then divided into four or five sub-lessons. Each week has one clear and simple lesson that kids will focus on. There will be Bible stories or verses to focus on through games, videos and hands-on activities. Each summer, students from preschool through finishing fourth grade spend four evenings learning Bible stories and building relationships with caring adults through a fun and fast-paced Vacation Bible School program. The fifth night is a family night, which brings all families together for a meal and a closing program to share what was learned throughout the week. This is for children in third through sixth-grade and takes place every Tuesday after school dismisses. Faith journaling and scrapbooking focuses on studying Scripture and learning how to journal. Students also learn how to document their faith journey through scrapbooking. Save the date for July 7-11! This year's theme is "Basic Elements," a science inspired VBS program.